As a poker player you do have to learn about every single aspect of playing, for if you don’t it is very true and fair to say that you will always be eaten alive by more experienced players! There are of course many unique aspects of playing poker that you are very quickly going to get your head around, if you want any chance of winning, and one of the most important aspects of playing is by you knowing which the best poker hands are. As there are a number of different poker game variants on offer to players that could be designed in a slightly different way, such as poker game variants that awards the pot to lowest ranked poker hand dealt out to plays at the showdown stage of the game, I will give you below a complete overview of the highest ranked hands down to the lowest ranked ones in games such as Texas Hold’em poker. There is of course one single hand that every single poker player is going to want to form, but for many that opportunity never comes, and that hand is of course the Royal Flush hand, which is a hand that contains an A, K, Q, J and a 10, all of which are of the same suit. 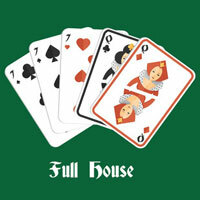 There is no other hand that can beat that hand in standard poker games only another Royal Flush hand can match it. But as I have mentioned it can be and is a very rare hand to be dealt out and many players can go a lifetime without ever being dealt it out! The second strongest poker hand that poker players can be dealt out when playing standard poker games is the Straight Flush hand, and that hand is one that will contact five playing cards that are in sequence and must also be of the same matching suit too. 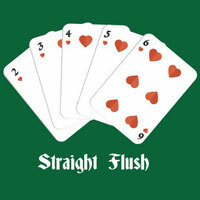 When playing poker the only other hand that can beat a Straight Flush hand is a Royal Flush hand that is described above, but you are very unlikely to ever witness or playing in a poker game in which both this and the above hand are dealt out to players in the same game due to those two hands rarity! If is very true to say that the derision and name of some poker hands that you could form do give you an idea of how such a hand is formed. As such, I presume you have already worked out just what a four of a kind hand is made up of, and that is of course four cards that all have the same rank, so an example of that type of hand could be 9, 9, 9, 9 and a J. 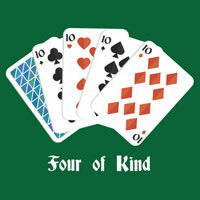 Only one four of a kind hand can of course be formed per game with the same rank of cards, but it is possible for another player to form a different four of a kind hand, and the one with the highest valued four of a kind will of course be the winner. It shouldn’t take you every long to master the hand rankings when playing poker, for they are to be fair quite easy to understand and as such allow me to now move onto the next hand you could form which is of course lower in value than those hands above, but stronger in value than those hands below. You could stand a fair chance of winning if you are holding a flush hand, and that is five playing cards that are not in sequence but they are all in the same suit. 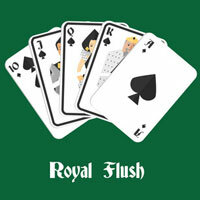 If you end up at the showdown stage of the game and another player has another flush hand then it will be the value of the playing cards in each hand that will determine which the highest is ranked flush hand is. So for example if two players are holding a 4, 6, 8, 9 and 10 and a 4, 6, 8, J and K both hands of course in the same suit, then it is the latter hand that is the winning one as the King has made that hand a much higher ranked one. 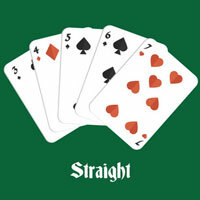 Moving onto the next poker hand which is lower in value than each of those listed above and that is the straight hand. You will be holding such a hand if you have been dealt out and have armed with the community cards five cards that are in sequence such as a 3, 4, 5, 6 and a 7 and they are not of the same suit. 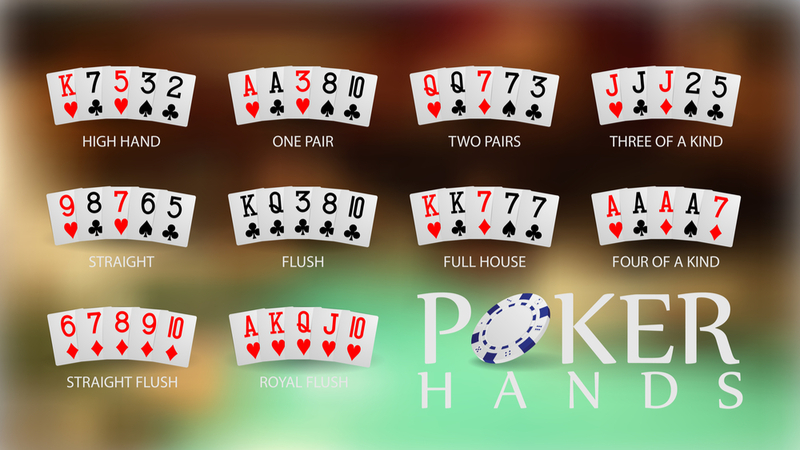 It is quite a common hand the three of a kind poker hand, and the name of that hand much like some of the other names given to poker hands in this guide, does give playing a very clear indication of what makes up this hand! 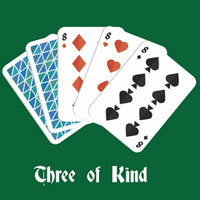 That is of course three cards that are all of the same rank, and as such an example of such a three of a kind hand could be an 8, 8, 9, 5 and King hand. As there are only four suits of cards it is impossible for a poker player to reach the showdown stage of the game and come across another player with the same three of a kind hand as the one they have! 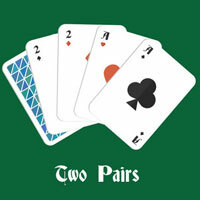 It is the two pair hand that is the next hand that you can form, but just keep in mind that all of the above ranked poker hands above are going to beat a two pair hand no matter what! 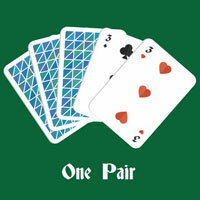 A two pair hand could be for example a hand such as a Q, Q, 7, 7, 4, and whilst it is extremely rare for another player to get to the showdown stage of a poker game and then reveal an exact same two pair hand as another player, if that does happen then it is the fifth card in that hand that is sussed to determine just which hand is the winning one. So for example if two players have made is to the showdown stage of the game and one players revels Q, Q, 7, 7, 10 and the other player reveals Q, Q, 7, 7, 5, it is the hand containing the 10 as the fifth card that is the highest ranked two paid hand! Moving onto the next hand you can be dealt out and that is of course a simple pair, that is when you have formed a hand with your five playing cars and two of those cards are of the same rank. Do I you have for example been deal out and have formed with the community cards a hand such as 9, 9, K, 7 and a 4 then you have a pair of nines. 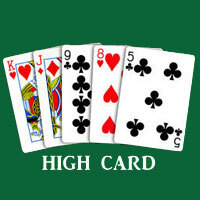 When using the community cards to help form a hand you will of course be using the highest ranked individual cards as that may help you form the winning hand if another player has the exact same pair as you have, as the next individual card and then the others if needed will determine which pair of nines as in our example is the winning hand. The only other possible type of poker hands that you are going to be able to form when playing poker is a hand known as a high card hand, and if any hand you have been dealt out do not fit into the above categories and hand types then the hand you are guaranteed of being dealt out is this one. The ranking of a high card hand however is determined initially by the highest valued hand, and then each other card in that hand will be used to determine the actual value of that hand. An example of such a hand could be a king high card hand. So for example if you have a K, 10, 7, 4 and a 2 in your hand that hand is a King high card hand, these types of hands are the most common ones you are going to be dealt out in any poker games and whilst they can win the pot, keep in mind that all of the above hands will beat this hand, as will a higher ranked high card hand than the one you have been dealt out!